Never Tell Me The Odds: Never Tell Me The Odds! - Twitter Handle Giveaway Contest! Never Tell Me The Odds! - Twitter Handle Giveaway Contest! Calling Rebels and Outcasts - It's GIVEAWAY TIME! Send us your suggestions for a new Twitter handle! We've been on Twitter as @NTMTOPodcast since the beginning - but it's time for a change! 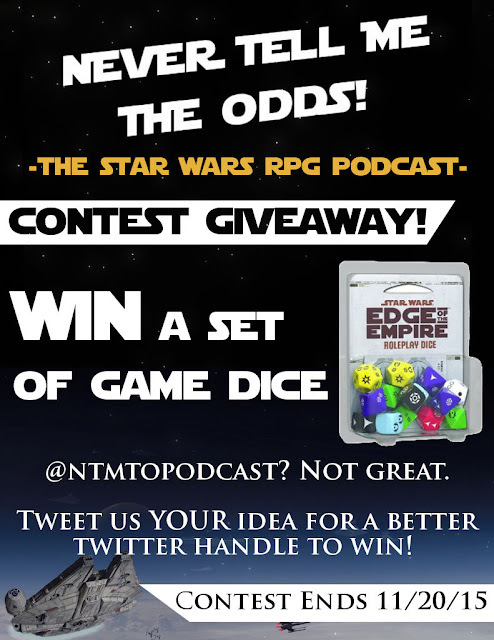 Send us your idea for a new Twitter handle, and you will be automatically entered to win a full set of Star Wars RPG game dice - perfect for playing Edge of the Empire, Age of Rebellion, or Force & Destiny! Contest ends this Friday, 11/20/14 - so enter now! Multiple entries are allowed per person. If you have more than one Twitter handle suggestion we'd love to hear them! Each suggestion will be counted as a separate entry. The contest winner will be chosen on Friday 11/20/15 at 7:00 PM PST. If you have any questions, get in touch either in the comments below, or on social media!